I worship periyavAchAn piLLai who is the son of yAmunar and whose katAksham will make emperumAn sriman nArAyanan's grace fall on us very easily. Born as krishnan as the son of yAmunar and sEngaNUr, he becomes to be known as periyavAchAn piLLai. He is one of the prime sishyas of nampiLLai and learnt all sAsthra arthams from nampiLLai himself. periyavAchAn piLLai became an illustrious AchAryan in our sampradhAyam by the grace of nampiLLai. 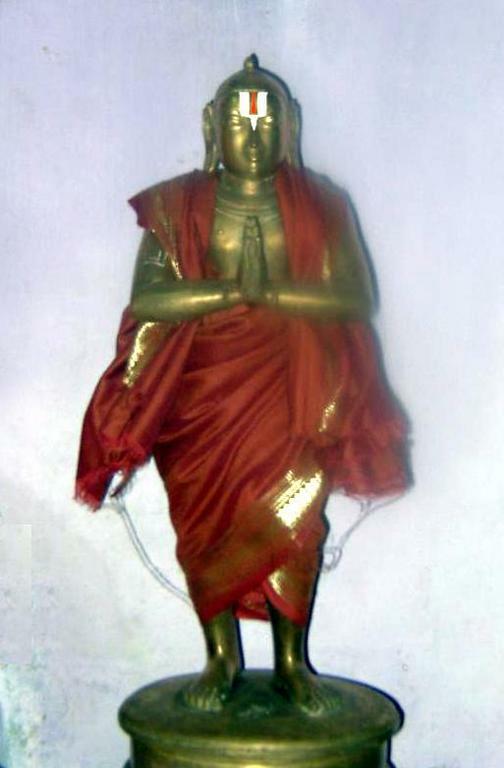 As in periya thirumozhi 7.10.10, it is said that thirukkannamangai empeumAn wanted to learn the meanings of thirumangai AzhwAr's pAsurams from kaliyan himself - so kaliyan took the avathAram of nampiLLai and emperumAn took the avathAram of periyavAchAn piLLai to learn all the meanings of the aruLicheyal. He is also known as vyAkyAna chakkaravarthi, abhaya pradha rAjar, etc. He adopts nAyanArAchAn piLLai as his son. 4000 dhiyva prabhandham - He has written vyAkyAnams for all of aruLicheyal. vyAkyAnams of approximately 400 pAsurams for periyAzhwAr thirumozhi was lost and mAmunigaL just wrote those missing pAsura vyAkyAnams. sthOthra granthams - He has written vyAkyAnams for pUrvAchArya srisUkthis like sthOthra rathna, chathu slOki, gadhya thryayam, etc and jithanthE sthOthram. sri rAmAyaNam - He has selected important slOkams from sri rAmAyaNam and written a detailed commentary for those in rAmAyaNa thani slOki. He was named abhaya pradha rAjar for his masterful explanation of vibhIshaNa sharanAgathi episode. He has also written many rahasya granthams such as mANikka mAlai, parantha rahasyam, sakala prAmANa thAthparyam, etc which explains rahasya thrayam in an excellent manner. He was a pioneer in documenting rahasya thrayam - piLLai lOkAchAryar took the essence of nampiLLai and periyavAchAn piLLai's teachings and wrote his astAdhasa rahasya granthams. His expertise in aruLicheyal and sri rAmAyaNam can be understood by his grantham called pAsurapadi rAmyAyanam where he uses words from aruLicheyal to explain the story line of sri rAmAyaNam in a crisp manner. The power of his grace can also be understood from the incident happened in vAdhi kEsari azhagiya maNavALa jeeyar. jeeyar, in his pUrvAshramam was serving in the thirumadappaLLi (kitchen) of periyavAchAn piLLai's thirumALigai. He was an illiterate but had strong devotion towards his AchAryan. Once when he overheard some srivaishnavas discussing some vEdhAntha vishayam, he enquired from them about the topic of discussion. Them being arrogant and considering him as an illiterate said they were discussing about a grantham called "musala kisalayam" (newly blossomed pounder). He went and mentioned this to his AchAryan and periyavAchAn piLLai out of his grace decided to teach everything to him. After a few years, he becomes a master of all sAstram and goes on to become vAdhi kEsari azhagiya maNavALa jeeyar and writes several granthams himself on our sampradhAyam. Just like periya perumAL, periya pirAtti, periya thiruvadi, periya AzhwAr and periya kOil, AchAn piLLai also due to his greatness became to be known as periyavAchAn piLLai. maNavALa mAmunigaL in his upadhEsa rathina mAlai dedicates two pAsurams specifically to periyavAchAn piLLai. Simple Translation: Out of his grace, nampiLLai orders periyavAchAn piLLai to write a commentary for thiruvAimozhi. Having that in mind, periyavAchAn piLLai wrote the most enjoyable commentary for nammAzhwAr's thiruvAimozhi which is the essence of all vEdhas. The commentary was written similar to sri rAmAyaNam, i.e., containing 24000 lines (similar to 24000 slOkams in sri rAmAyaNam). Simple Translation: It is due to periyavAchAn piLLai's commentaries for aruLicheyal, the great teachers are able to understand and propagate the true meanings of aruLicheyal. Without these vyAkyAnams, no one can speak about the inner meanings of aruLicheyal. Also, mAmunigaL in pAsuram 39, identifies that periyavAchAn piLLai was one of the 5 vyAkyAna karthAs for thiruvAimozhi, there by saving it and propagating it to everyone since without the vyAkyAnams we cannot understand the inner meanings of aruLicheyal. When some asks if we are target of emperumAn's krupai or leelai - periyavAchAn piLLai says "if we think that we are caught in this samsAram, we are target of emperumAn's krupai and if we think that we are happy in this samsAram, we are target of emperumAn's leelai". When some one asks what does pArathanthriya mean? periyavAchAn piLLai says that depending fully on emperumAn's sakthi, completely giving up upAyAntharams (including self efforts) and ever longing for bhagavath kainkarya mOksham is pArathanthriyam. When some one asks what is upAyam? Is it us giving up everything or holding on to him? periyavAchAn piLLai says that both are not upAyam it is emperumAn who made us give up everything and hold on to him is the upAyam. Once when bandhu of periyavAchAn piLLai is worried and he asks for the reason. She says she is very worried since she has been in this samsAram since anAdhi kAlam and with so much karma how emperumAn will give her mOksham. For that periyavAchAn piLLai says, we are emperumAn's property and he will take us when he wants to irrespecitve of our karmas. When a srivaishnava finds fault in another srivaishnava, periyavAchAn piLLai says that yaman is asking his servants to move away from srivaishnavas without looking at their faults, piAtti says "na kaschin na aparAdhyathi" - dont look at anyone's faults, perumAL says even if my bhakthas do mistakes it is good only, AzhwAr says who ever emperumAn's bhakthas are, they have to be praised. So sarcastically he says, some one needs to say the faults in srivaishnavas and let that some one be this person who finds faults in the other person. During a discussion about the greatness about bhAgavathas, some one starts speaking about emperumAn and periyavAchAn piLLai says why speak sAmAnya vishyam (general matters) when speaking about visEsha vishayam (special matters). periyavAchAn piLLai says every srivaishnava must have involvement in aruLicheyal. Today being AvaNi rOhiNi, the thirunakshathram of periyavAchAn piLLai, let us bow down at his lotus feet and ever remember his contribution to our sampradhAyam.